While working at a Regus office last week, I noticed a buffet table being set up in the reception area. Once it was ready, everyone working there was invited to help themselves. Wonderful! However, this wasn’t your regular kind of buffet table. This was a promotional event for the new Onken Porridge2Go pots and the entire table was filled with little individual pots of porridge. Porridge lover that I am, how could I resist? I helped myself to 2 pots (one for a lucky family member) and another for me. I ignored the sachets of honey, as this porridge is already sweetened. 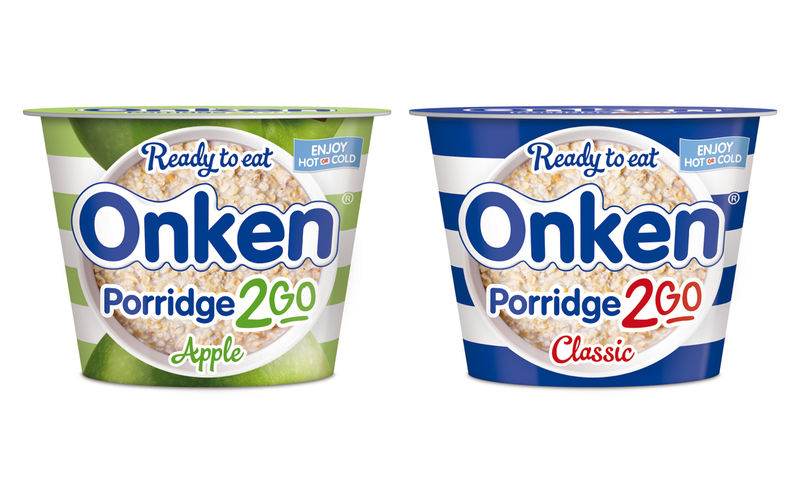 Onken has launched a new range (well 2 varieties) of fresh porridge pots, available in the food-to-go aisle of UK supermarkets. 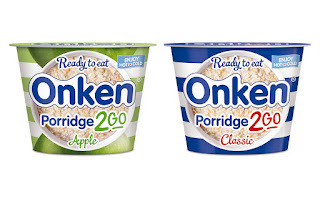 It’s been launched under the Onken name, who are most commonly associated with yogurt. In fact, they make my favourite natural yogurt which I've reviewed here. It’s available in a 150g single serve pot with peel off lid costing a recommended £1.25. 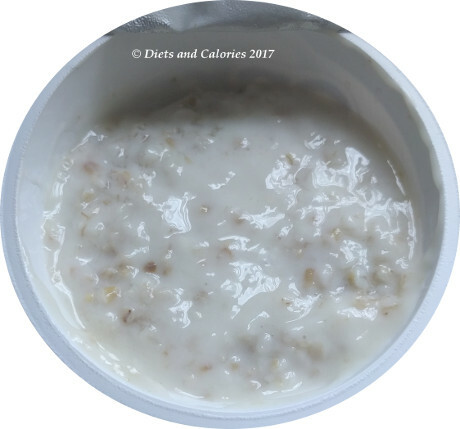 The product offers a simple combination of oats and semi-skimmed milk and the two flavours are: classic, and apple with crunchy apple pieces. I couldn’t see any Apple variety so only had the Classic to try. I was a bit disappointed to see the porridge is already sweetened with sugar, so for this reason, I probably wouldn’t have bought it. But as it was a freebie, I was happy enough to try it out. "slightly sweetened and offers a healthier alternative to existing instant ambient porridge variants." 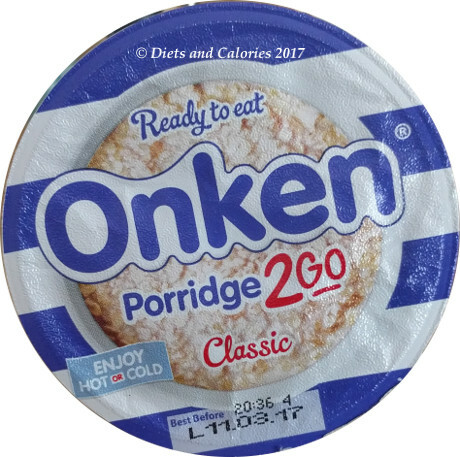 Onken Porridge2Go is designed to be eaten hot or cold, or even room temperature as it doesn’t have to be kept in the fridge. I tried it cold first. Peeling off the lid reveals a pale, thick and creamy looking porridge. I’ve never eaten cold porridge before (it’s different to Bircher muesli), and as such, it strongly reminded me of eating cold rice pudding. In fact, it tasted very similar. The main difference to regular porridge is that these oats are quite chewy which isn’t what I’m used to. It was totally sweet enough for me (I have a sweet tooth) but some may find it a little too sweet. For example, hubby tried some, and said it was too sweet for him. He also found the chewy texture quite odd and couldn’t really enjoy eating cold porridge. I heated it up as well. The instructions for doing this are to peel off the foil lid and microwave for 60 seconds. However, I'm not happy about microwaving food in plastic pots so I emptied the contents into a glass bowl first. Heating didn’t alter the taste or texture. So it's really a matter of individual preference and accessibility to a microwave as to whether you eat this hot or cold. I see this porridge as a snack, like the little Ambrosia Rice Puddings rather than a breakfast. My youngest hesitantly tried some cold and agreed it tasted like rice pudding which she loves. Overall, if I’m going to have porridge, I like cooking it the traditional way and can’t see myself ever buying this as a substitute for regular porridge. Putting my nutritionist hat on, I can’t agree with the statement that this is a ‘healthier option’ but I suppose it’s all relevant depending on what you’re comparing it with! Each pot contains around 3 teaspoons of sugar (some of that comes from the milk). And why are there thickeners in there? Oats are thick enough on their own. Since I likened it to Rice Pudding, I’ve done a small comparison between the nutritional values and ingredients of Ambrosia Rice Pudding and Onken Porridge 2 Go. Looking at the nutritional comparison, it’s uncannily similar. Same amount of fat and sugar, more calcium in the rice but more protein in the porridge. Calories are similar for both as is the salt value. There are no thickeners in the rice pudding. If you were going to market this porridge as a healthy breakfast, then why not the rice pudding? I'd also like to point out that this isn't a low sugar product (see traffic light below) as mentioned in the quote above! Currently Onken Porridge2go is sold in Tesco for £1.25. At the time of writing it's on offer at Tesco or 62p! Nutrition Information: per 150g pot: 173 calories, 3.8g fat, 1.5g saturated fat, 27g carbs, 13.5g sugars, 1.1g fibre, 6.8g protein, 0.15g salt. I was looking for a review for this. Thank you. I picked up this pot today. I've been told to eat more porridge because I have stomach issues and This was so easy to heat up and eat. It was also just the right quantity for me but I'm always concerned about sugar in these sorts of 'healthy' options. Disappointed that it is quite high. From an ibs sufferers perspective, I didn't experience any symptoms that morning and felt good. I'd love a no sweetened alternative to this if it exists.